It’s that time of year again!! Falalalalalalalala! We’ve been decorating for about a week around here, and finally it’s all coming together. I am so excited to decorate this new house for Christmas. It was MADE for Christmas decorations. Some of my other projects (ahem: the tree) are still under construction, so let’s start with the mantel! This year I decided to do something kind of whimsical and fun and happy, without any fake greenery in sight. Trust me, there is plenty more fake greenery to be found in the rest of my Christmas decorating. You’ll see that soon enough. 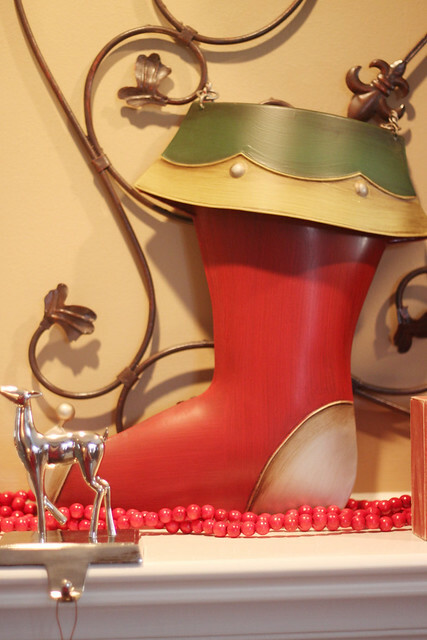 One of my favorite things on the mantel is this Holiday Door Bucket from Willow House. I purchased this back when they were still Southern Living at Home, and thankfully they kept this in their line when they transitioned over to the new company. Yesterday I ventured out to our new outlet mall in the Birmingham area and found these two primitive wooden plaques at The Old Farmers Almanac store. Primitives by Kathy is the maker of these two pieces of painted awesomeness. Love them both. I have no idea where the wooden reindeer is from. He came from my husband’s pre-Beth Christmas stash. Isn’t he cute?? Speaking of my husband, here he is attempting to light our gas logs for the first time since we bought this house. Hey babe, thanks for helping with my photo shoot! Isn’t he cute?? Ahhhh this shaved wood wreath is my new favorite thing. Purchased it at the Country Living fair from this vendor. I love that it’s so versatile for any season. The strands of wooden cran-beads are also from my husband’s pre-Beth stash. It was like a treasure trove in there! The rustic brown metal Moravian star came from Pier One off my wedding registry in 2004. It’s a way back playback decor item. I believe these stocking hangers came from Target after Christmas sale a few years ago. They represent our little family of three pretty well, I think. Since we are toddler friendly around this joint, we can’t hang our actual stockings from the stocking hangers. We tried, but of course the first thing Garrett did was try to pull the stocking off onto his head. I like to avoid potential brain injuries in my decoration, so off came the stockings and up went these cute metal stars. These were in my lake cabin stash so I’m having to dig deep to remember where I purchased them but I believe they came from these folks. 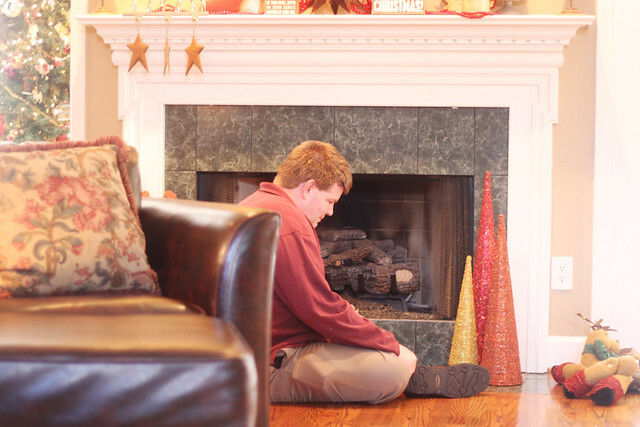 So there she is… my 2010 Christmas mantel. Happy Holidays to all of you! In case you are just visiting I am giving away three tickets to see Garth Brooks in concert in Nashville! Click here to enter! « Ode to the sleepy boy. I love it all, and particularly the little signs. Just lovely. I love that you mixed things new and old. And, I spy a beautiful tree in the background. Can’t wait to see more of that. I’m kind of obsessed with other people’s Christmas trees. LOVE your style! Great pics! That’s FABULOUS!! I’m so impressed. Cute! I love your signs and the wreath. Those bobble-head trees are super cute as well. 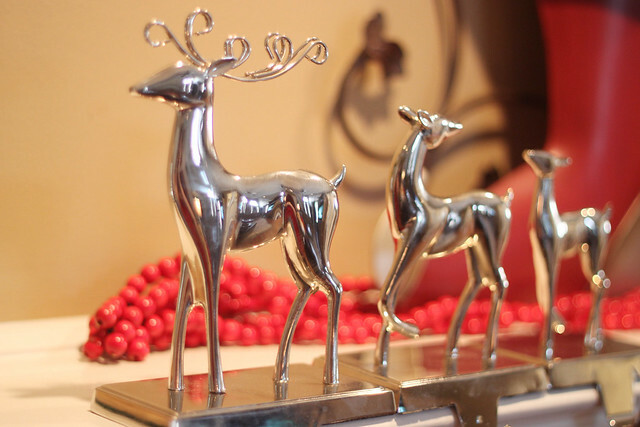 Your mantel is wonderful… I just feel the holiday fun! Can’t decide what I like more, the fun trees, the wooden signs, or the wreath! Good stuff! Thank you so much everyone! I’m loving all these beautiful mantels over on the link party! I like it!!! Completely different from the way I decorate, but I love how whimsical it is. The little signs are great. And I like how you hung stars from the stocking holders. Cuter than stockings in my opinion. Not that you asked. But I’m giving it anyways. And who does buy stuff from Pottery Barn? Thanks for sharing your mantel. I love it! It’s so festive and fun! The red beads are my favorite – really cute! What a gorgeous mantel. And I love that your husband has pre-Beth Christmas decor. My husband came with no previous holiday decor and hardly notices that I decorate for Christmas. He’s not much of a decorator I guess. This is my first visit to your blog, but this post has me wanting more. I’m gonna look around! I adore that scrolly metal thing and your subway-art-signs are gorgeous too. Heck I love your whole mantel. I love the whole thing!!!! The wreath is so beautiful on the iron scroll. And the little whimsical trees are so cute. I love the pictures and whimsy trees! 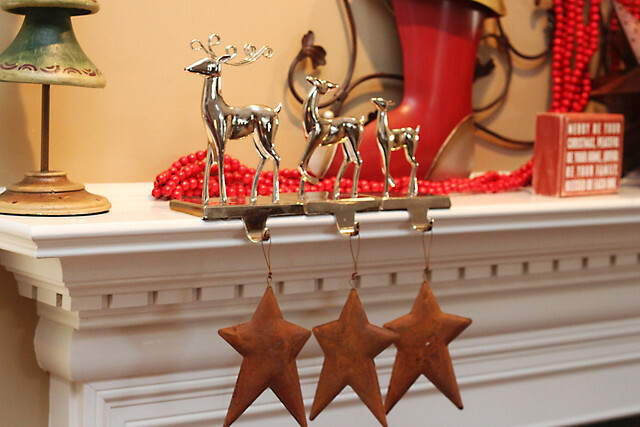 I also like the way you hung stars from the stocking holder… so unique and cute! I think its beautiful. Very warm and outdoorsy! Beth! I love your mantel, so cute and whimsical. those plaques are so neat, love them. Great job with all of those things. I love that first pic with your tree in the background. Gorgeous, looks like a postcard. our fireplace is SO hard to get started. So, we never light it! 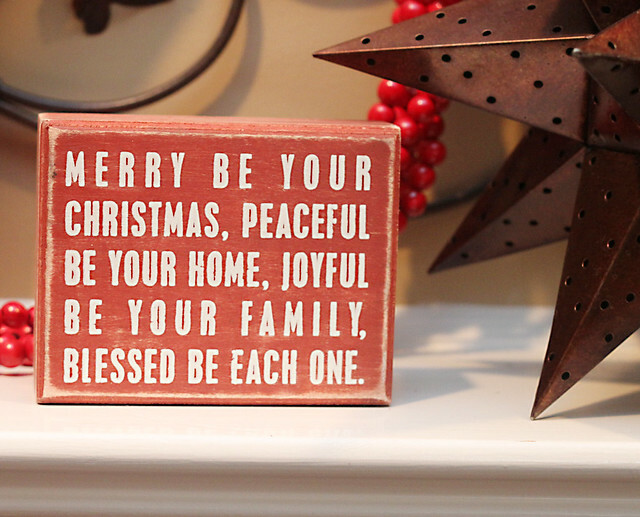 I just saw this at the holiday home link up party, and wanted to tell you that I thought your mantle is so adorable. I love how you styled it all together, it looks beautiful. looks fantastic! 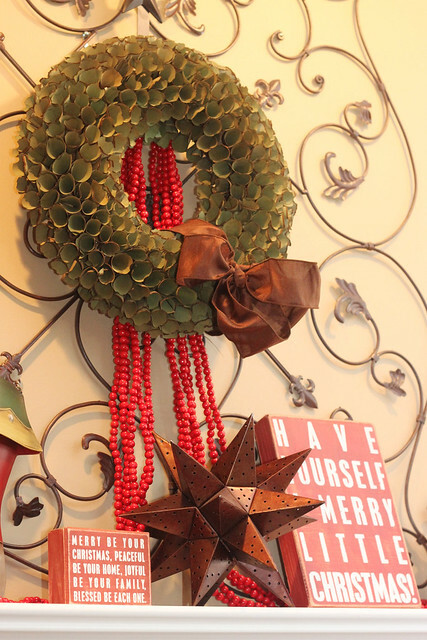 great purchase on the wreath – you will have fun with that all year round! It’s so cheerful! I love it! So pretty and festive! Love the signs! So so cute! 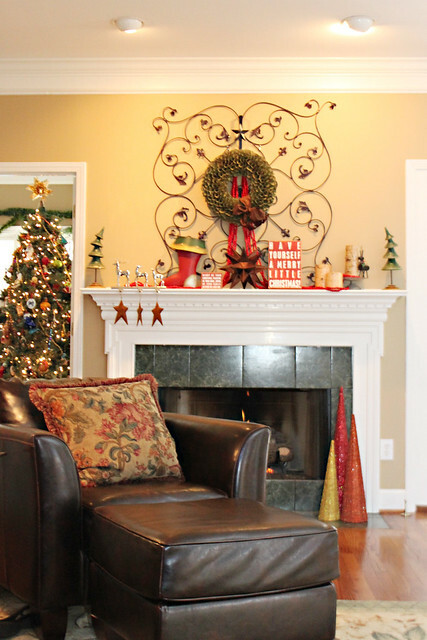 I especially like the two red, wooden signs, as well as the sparkly trees on the floor by your fireplace! I found your blog over at Layla’s mantle party- enjoyed it! Gorgeous! I love the little sign. Great mantel. Have a fabulous week. 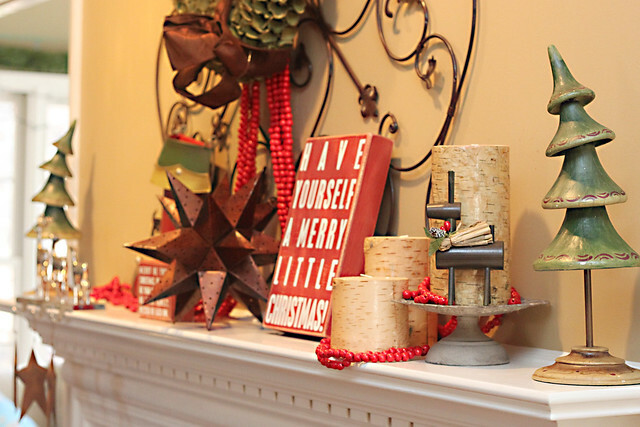 i love the whimsical feel your mantel has to it! 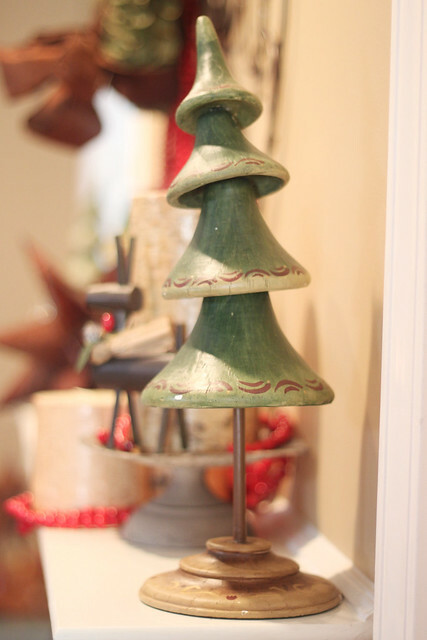 i am in love with the bobblehead trees…want!! gorgeous! One of my favorites mantels I’ve seen! Looks wonderful! I’m having a great time getting inspiration. Can’t decide which direction I’ll go this year. Red? White? Silver? Whimsy? Thanks for sharing! 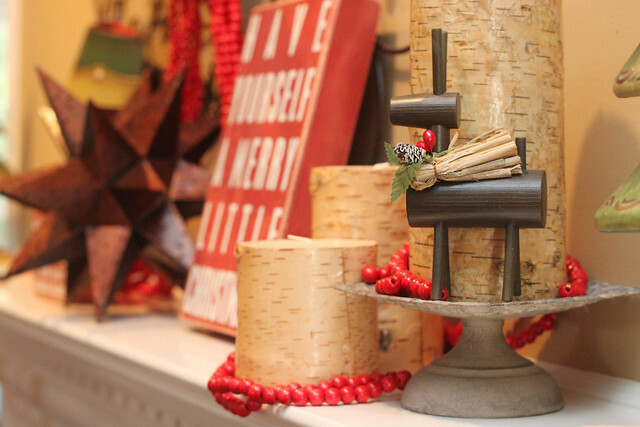 Lovin the whimsy of your beautiful mantle! I love the stocking hangers, Sweet! The signs are cool, too. Beautiful job. Just started following your blog and added to my reader. Would you like to come decorate for me. 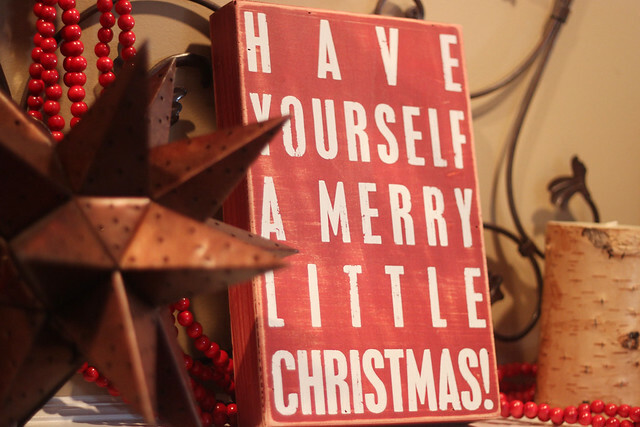 i love your little ‘have yourself a merry little christmas’ sign. i just made one for my own home this holiday season. I love your unusual collection of items that all together create a very whimsical mantel including the stars hanging from the stocking holders. I think that just makes the mantel. Love the bobbley trees too. I love your red signs! Hope you don’t mind if I show them on my blog…we’re moving this week, so everything holiday is still packed away. Since I can’t post about decorations in my own home this year, I highlighted a few I found in others! The wreath. That wreath. I just died.